BrÃ¼tal Legend fans set a new world record for mass air guitar this Saturday at the Download Festival in Donnington Park. 440 fans attending the Download Festival gathered at the EA Hub, a special trailer where people could try out a range of games from Electronic Arts, and pretend-wailed their faces off to the catchy rhythms of the classic MotÃ¶rhead track Ace of Spades. A Guinness Book of World Records judge was on hand to verify the new record for most people playing air guitar at one time, which handily trounced the previous mark of 318 people that was set in 2008. "That was one of the raddest jams I've ever been involved with," said Christian Stevenson of Kerrang FM, who led the shred. "The crowd played their air guitars better than Eddie Van Halen! Then they destroyed 'em good and proper. Who cares, right? They can go to the air guitar shop and get another one. Sick to the infinity of sickness! I want a crowd like that at every gig I'm at. Awesometacular - air guitar world records rule!" 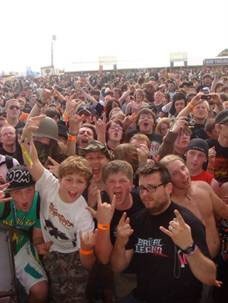 Established in 2003, the Download Festival is a three-day music festival held at Donnington Park. The 2009 event was headlined by Faith No More, Slipknot and Def Leppard, with appearances by Limp Bizkit, Marilyn Manson, Dream Theater, Lacuna Coil, Chris Cornell and many others.